Sadly, the cast, scenery and extras can’t save this film or Director Scott. This was indeed a bold project that unfortunately falls short of the past versions. We all know the story of Moses. Born a slave, grew up in the home of the Egyptian Pharaoh and eventually led the Jewish people out of slavery. If you are over the age of thirty you can remember watching Charlton Heston (Ben-Hur) playing the role in The Ten Commandments. Now Director Ridley Scott (Prometheus, Alien) has created his own big screen version. Exodus: Gods and Kings is out now on Digital download and will be available on Blu-ray and DVD on March 17, 2015. Starring Christian Bale (The Dark Knight, American Psycho) as Moses, this version does nothing to drawn the audience in and ends up being two and a half hours of pretty pictures but boring storytelling. Someone should send Scott a memo that just because a movie is long, doesn't make it epic. Sadly, Exodus is at best a fair effort to a retelling of a long beloved story. The screenplay written by Adam Cooper (Tower Heist), Bill Collage(Tower Heist), Jeffrey Caine (Goldeneye), and Steven Zaillian (Moneyball) is dull and uninteresting which may have been the problem from the start. The film has too many details that feel squeezed into the story and some pieces have even been altered or deleted all together. I feel Scott left out or changed some important parts while leaving in other unnecessary scenes. Scott also draws out some scenes to the point of annoyance. When depicting the plagues, the scenes drag on for much longer than necessary and, as usual with any type of fighting scene, the action sequences are extended for no other reason than to watch people fight. I find those scenes don't add much to moving the plot along but I'm sure they appeal to a certain segment of the population. The visuals are probably the only thing I enjoyed in the film and I give Scott credit for creating sweeping landscapes that give the movie an air of authenticity. Unfortunately, he also depicts the evening in a sort of bluish haze that is simply weird and confusing. He doesn't do a very good job of differentiating between the days as one minute the scenes are in twilight and the next in perfect, bright sunlight. Again, he tried to squeeze in too many details and it didn't work. Bale is,as usual, a strong lead as Moses and Joel Edgerton (The Great Gatsby) is excellent at Ramses. I happen to like John Tuturro (Transformers) very much as an actor and he doesn't disappoint as the short -lived Pharaoh Seti. However, Ben Mendelson (The Dark Knight Rises) plays a caricature of the viceroy that is simply distracting. Luckily he isn't in many scenes. The advantage of HD digital Download is you can watch it anywhere, anytime and you can purchase it before the Blu-ray is in stores. The picture quality is excellent with sharp details and the audio is full and lush. The extras include some enjoyable features such as a look at Moses as the legendary lawmaker. Unlike most films the deleted scenes for this movie are actually worth watching and the enhancement pods gives the viewer over 45 minutes of vignettes of "behind the scenes" snippets that are fairly interesting. Download Exodus: Gods and Kings from the iTunes Store in Digial HD. 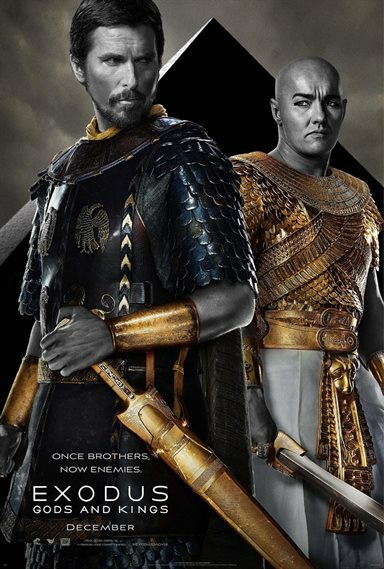 For more information about Exodus: Gods and Kings visit the FlickDirect Movie Database.